Robert Orfali, the guru of client/server systems in the early days of Silicon Valley, co-authored three best-selling books that demystified the complexity of these mission-critical systems and made them understandable to a whole new generation of programmers. The books sold over a million copies. In this book, Robert uses his analytical skills to deconstruct the most complex system he has yet encountered: our modern end-of-life system. He wrote this book after helping his soulmate and coauthor, Jeri, navigate her death from ovarian cancer in 2009. The deep emotions Robert felt allowed him to look at how we die from a different perspective, another angle. Robert also wrote Grieving a Soulmate. Personal note from author: "With these two contributions behind me, I now hope to get out of the death business until my time comes. There’s just so much of this stuff one can take. On the other hand, this was my window to write these two books. I was writing while under the influence of the deep emotions that accompanied the death of my soulmate, and I was able to look at the system from a different perspective. These are the two books I wish I had read before Jeri's death. Hopefully, they will help guide you or your loved ones through the end-of-life maze. " Robert Orfali and his soulmate of thirty years, Jeri, were both in the computer software field in the early days of Silicon Valley. They co-authored three best-selling software books and went together on several world tours to promote their technology. Jeri was diagnosed with ovarian cancer, in 1999, shortly after they moved to Hawaii. 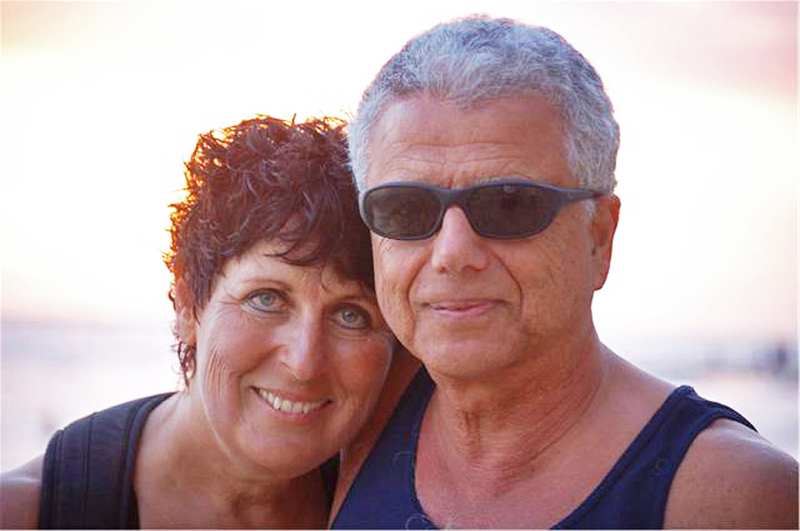 Jeri and Robert spent the next 10 years fighting Jeri's cancer and learning how to live with it. Jeri even learned how to surf during her chemo years. She went from "Silicon Valley Executive Woman of the Year” to "Waikiki Surfer Chick." Jeri received one of the most moving surfer funerals ever. Her ashes are in the ocean at Waikiki. FQ: As you mention in your new book Death with Dignity, we live in a “death-denying culture” where people don’t want to even think about dealing with death, let alone advocate for legislation. What would you like to tell people who want to put this topic off until “later”? We’ve made a Faustian bargain with modern medicine. It allows us to live to longer, but the price we pay is prolonged dying often with suffering akin to “torture.” The sad truth is that 80% of us will not leave life the way we would have liked to: “at home and without needless suffering.” Closing our eyes and letting the system follow its course could easily lands us intubated in an ICU at the end of our lives. To protect ourselves and our loved ones, we need to understand our choices. And, we need to think about them while we still can. It could make the difference between having a relatively “good death” and a very “bad death.” It’s the difference between dying in the ICU versus dying under the care of hospice. Yes, denial can have some serious ramifications. I tell my friends to spend a few hours informing themselves about death and dying. For example, reading my book may help you or someone you care about navigate this very strange landscape we call “end of life.” You’ll be able to better understand your choices. With the e-book available for only $0.99—which is as close to free as Amazon would allow it—there’s no excuse for not reading it. Note: Reading about death won’t kill you. FQ: You briefly talk about “living wills.” Your statistics show that less than half of this country’s population have living wills and I suspect many don’t even know what they are. Again, what would you say to people about not putting this off? Don’t put it off. Remember the family tug-of-war over poor Terri Schiavo. You can easily protect yourself from these types of situations by providing an advance directive consisting of two documents: 1) a living will that specifies the type of life-support care you would want in various situations, and 2) a durable power of attorney that lets you appoint your health-care proxy—the person who will make health-care decisions for you in case you become incapacitated. Be sure to pick a proxy you can trust to navigate the health-care system on your behalf. FQ: A large part of your argument for assisted dying is that you’ve seen first hand the comfort knowing how/when to die can provide the terminally ill. Do you think many in the end-of-life care area (hospice, etc.) ignore this? I believe that assisted dying is just one more palliative option. Ninety percent of the patients who used that option in Oregon were also enrolled in hospice. For some, self-administering the pills is more comforting than terminal sedation. It gives them more control over the timing of their death. For others, the pills serve as a form of “good death insurance.” I believe that terminal patients must be allowed to decide what’s best for them: It’s “my life, my death, my choice.” I also want to point out that the current practice of terminal sedation is very capricious. The usage numbers in hospices across the U.S. vary between 1% and 52%. With such large variances, obtaining terminal sedation in a hospice becomes pure luck of the draw. Yes, we need all the insurance we can get. FQ: You talk about the minuscule amounts that might be saved for Medicare by ending terminally ill patients’ lives early, thus arguing that the savings are too small to solve the health-care financial crisis. But do you think that some politician might twist those numbers and/or use them to scare an uninformed public into fearing death panels? The facts speak for themselves, but as you point out politicians can twist anything. However, twisting in this case would be unfortunate because the system is already overly-complicated, and all this hysterical talk about “death panels” is not helping. As a society, we need to have a more rational conversation about death and dying. Death remains one of the last taboos of polite conversation and yet it affects us all. FQ: Please tell our readers about FUD. FUD is an acronym for “Fear, Uncertainty, and Doubt.” The FUD is meant to frighten people; it works against the legalization of assisted dying. Here’s what happens. The opponents of assisted dying dream up some alleged societal concern, and then connect imaginary dots that begin with legalization. They imagine steep descents down slippery slopes that result in horrific outcomes. Once they establish the possibility of a negative consequence, the burden of proof (or disproof) falls upon the shoulders of the people who want to legalize assisted dying. In the book I try to debunk the FUD by using empirical data and solid research. I try to address every one of these slippery slopes by analyzing both the risks and the logic. I can tell you that none of the anticipated slippery slopes have occurred in either Oregon or the Netherlands. The same slippery slope arguments have frequently been made against the termination of life support (“allowing to die”). In the U.S., people have been allowed to die since the “Nancy Cruzan” Supreme Court decision in 1990. In the last 20 years, millions have died through the termination of life support; there were no slippery slopes. FQ: In your book, you stress the importance of discussing all aspects of dying and euthanasia with your doctor. But as our country moves to more managed care and many poor people don't have a true relationship with their doctor, and are instead more of a number than a person, do you think discussing euthanasia and having a meaningful conversation(s) with a doctor might become unrealistic for some? In Oregon assisted dying offers the best protection for minorities and the poor. Why? As soon as they ask for the Nembutal (the lethal barbiturate), they become protected VIPs. Doctors, palliative care specialists, and social workers will bend over backward to find available resources and provide end-of-life care. The Oregon safeguards are designed to protect the vulnerable. Instead of languishing in decrepit state-run nursing homes and hospitals, the poor and minorities may find themselves in the hospice system. This would give them access to the best palliative care available. Of course, the Nembutal is purely voluntary; there is never an obligation to take it. However, if all else fails, the Nembutal will provide a peaceful death, which is a lot more humane than the alternative. It’s win-win for the poor and minorities. FQ: Finally, you’ve been on a real emotional journey for the past few years, indeed, since Jeri's illness was diagnosed. Add in the time and effort to publish two books about the ordeal, Grieving a Soulmate and Death with Dignity. Tell us, how are YOU doing today? Thank you for asking. Helping Jeri fight her cancer for almost ten years was not an ordeal. We had each other and together we could do almost anything. Looking back, these were very sweet years. My ordeal started after Jeri’s death: the grief bursts I experienced were unbearable. I discovered that dealing with the grief in its totality was too overwhelming so I separated the bursts into manageable buckets. I then worked on techniques for eradicating the grief in each bucket. I describe all this in Grieving a Soulmate. It’s divide and conquer. My grief bursts are long gone, but I’m still healing. I miss Jeri’s physical presence, but the love relationship continues after death. It’s like having a long-distance love relationship. I talk to Jeri all the time. This continuing love bond is a very important part of my healing.